Being on the early stages of Intro is rough. If you need the GAPS Program and gut healing (which most of us do these days), rough may be an understatement. It can be especially tough on kids. Besides the symptoms of die-off that they may experience (feeling fatigued, flu-like, and generally cranky), there is also the fact that you just removed some of their most beloved foods from their diet and replaced it with a whole lot of chicken soup and cooked veggies. While tea may sound good to adults (unless you went on Intro cold-turkey from a serious coffee addiction), it is usually not the beverage of choice for the average child living in America. And sometimes, after eating all that soup and everything soft and well-cooked in it, you just want something with a little substance and texture. And that is where gummies and Jello come in. 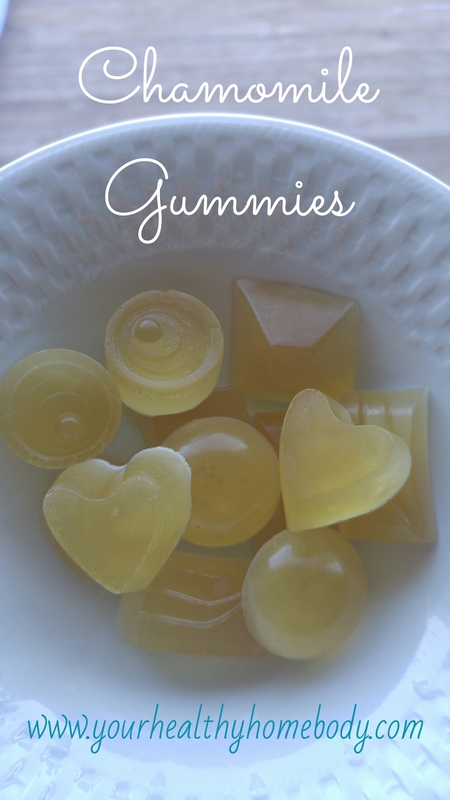 Making your own gummies and Jello from grass-fed beef gelatin can be one way to get some nutrition into your kids early on. Not only that, but it may also make a good treat to give them when they successfully take spoonfuls of meat stock (think bartering; 1 gummy for 1 spoonful). The recipes that I will share are very versatile and can be easily adjusted later on when juice is introduced into the diet, leading to a variety of flavors of gummies and gelatin snacks. You can even make gummies from ferments like kombucha! Below is a recipe for gummies made from chamomile tea, legal from stage one of the GAPS Introduction Diet. I will soon be posting a recipe for gelatin (Jello) made from ginger tea. Pour 1 cup of boiling water over 3 chamomile tea bags in a mug and let steep for 5-10 minutes. Place 1 cup of cold filtered water in a medium sized bowl. Sprinkle 7-8 Tbs. of grass fed gelatin over top of this, allowing to sit for about 30 seconds before stirring it in. It will create a thick, gummy, gel-like texture. Remove the tea bags and discard them. Pour the tea over the gelatin mixture in the bowl. Mix until smooth and the gelatin has dissolved into the hot tea. If necessary, add a little more boiling water until the mixture is smooth. Add in honey to taste and mix well. You may pour this mixture into an 8×8 or 9×9 glass pan or into individual candy molds. Place the gummies into the fridge for about 30-60 minutes, until they are more solid. If you used a glass pan, cut the gummies into small squares and place them back in the fridge for storage. This recipe was a winner for us this week! I am so excited about this recipe! Very interested to know what tea & gelatin you use?!? For the tea, I like to use Traditional Medicinals organic chamomile tea. For gelatin, I use the Great Lakes unflavored beef gelatin. I’m glad you’re excited to try it; let me know how it goes! Thank you sooooo much! Both are in my cart ready to go! So can you please tell me, how would you do this with Kombucha? My daughters actually really enjoy kombucha so I would love to turn it into gummies for a gut friendly snack. Instead of the one cup of cold water, I would use cold kombucha. Skip the tea bags that the recipes calls for, and then follow the rest of the directions. You may need to experiment a little depending on the flavor as it will be milder than drinking the kombucha itself. I hope they like it! Sometimes my gummies turn out clumpy and/or frothy. Do you know how to avoid this? I sprinkle the gelatin on the cold liquids prior to adding the boiling liquids. I make sure to use a REALLY big bowl to do this so that the gelatin is spread out and doesn’t clump up. I’ve found that this helps the final product to not be clumpy and frothy. When you use a small bowl, the gelatin tends to pile up and doesn’t dissolve as easily. Hope this helps! All i have access to are the knox gelatin powder envelopes. How many envelopes should I use to make this recipe? Ooo, double check on the package. I believe that 1 Tbs. equals one packet, but that may be one you want to investigate further. It’s been a while since I used their gelatin. I would recommend looking further into a brand like Vital Proteins or Great Lakes as their gelatin is of higher quality. how long do these keep in the fridge? Thanks! Hannah, I would say a week or so, but honestly they never last longer than a day or two in our house!